Got ourselves a Colin MacNeil cover this issue and very nasty it is too. Those teeth give Dredd an almost animal quality, like he's gonna bite your ear off! I was VERY excited to note Jack Point (The Simping Detective) and was hoping it was still Spurrier and Frazer on duty. And some dude with a big sword and scars. Looking forward to meeting him (although just in the comic, not in real life - he looks a hard so-and-so). Right, there is a lot to get through so let's start with a bit of an intro as to what is going on. The Meg has been through some cosmetic and content changes. On the cosmetic side, Sir Alan has fired the previous production droid and replaced him with PYE-04. Maybe 'fired' is a bit harsh but I was going for an Apprentice gag... So the Meg now has a spine that lists the issue number and Thrills inside as well as some other minor alterations inside. On the content side, there are a tonne of new features. So get yourself a nice long drink and sit back, because there's a lot to cover! Shall we start with Old Stoney Face? Lets. But where to start, because he had more than one outing... The first story was called Bite Fight and saw Dredd attempting to take down a gang who are organising illegal bite fights across the city. However it doesn't go as planned and at the end of the episode, a character from another Meg story appears in a most unexpected place. Great story telling by John Smith (does that provide a clue to our mystery guest star) and some really wonderful painting by John Burns. If you have read previous reviews of mine you will know I sometimes am a bit down on painted artwork, particularly with fast-paced stories. But the two Johns work in perfect harmony. The second story is written by Gordon Rennie and drawn by Simon Coleby. Meat Patrol sees Dredd volunteering for Meat Wagon duty, to the surprise of the wagon driver! This is Dredd brushing up on all aspects of Justice Department services and I really liked it. I thought it was a neat idea I won't say much about it except it trundles along for a few pages until the shift starts getting a bit too exciting for our regular Resyk worker. I want to see more car chases involving a Meat Wagon, and lets face it, Gordon Rennie is the car chase master! The third story is a text story by the marvellous Si Spurrier. Whilst I liked Cam Smith's illustrations, it did rather spoil the surprise of who the character sharing the bench with the blind man was. Thinking about it, the story was called Judge Fear's Big Day Out, so that didn't help either! It's a great story, though, and even if you don't usually like the text stories, I would recommend reading this one. Lets talk about the return of Jack Point in the new Simping Detective story Innocence: A Broad. Jack is on the trail of a gang when he stumbles across another detective's case. Again, it's Spurrier and Frazer handling things and again it looks like it's going to be a cracker of a story. Young Middenface also returned this issue with Grant and Ridgeway on duty and, as before, it looks like it will be a corker. The muties have a tough choice to make when a mutie-hating First Minister is elected. I have banged on long enough in previous reviews about how much I love these stories, and these new episodes didn't disappoint. The third cover star, with the sword and scars, was Shimura, who began a new story called Execution. I haven't come across this character before, although I had heard of him, so it was great to finally read a story with him involved. Shimura is a rogue judge in Hondo City (old Japan) who Dredd hunts down to persuade him to do some dirty work for the Mega City One Justice Department. It's the fabulous Robbie Morrison writing the script with Andy Clarke on artwork, who is new to me. I liked Andy's art, particularly the opening frame of Hondo City, and the story had me gripped from the get-go. A good opening episode, and am looking forward to seeing where this goes. Some glorious art in the Anderson WMD saga, some lovely full page splashes from the brushes of Ranson, but we are still wandering round in Anderson's mind kind-of aimlessly. The characters don't seem to know what they are doing, and I think I have stopped caring. Gordon Rennie chose to explore the world of naming characters in You're Next Creep, which is becoming less and less of a rant and more and more of a discussion. I like his stuff, but he has definitely run out of things to be cross about. The Dredd Files limped on... Dreddlines had lots of positive letters this time, including the return of Floyd! Oh - and I almost forgot the interview with John Burns, which was really insightful. This has replaced The Interrogation Cube, which was nothing more than a series of short questions about fairly inane subjects, with a far more in-depth interview - shortened to being called Interrogation. I like getting into the heads of creators, so reading about how he got into comic art and the publications he has worked on in his long career I find fascinating. Others may skip it, or wait for a droid they are more interested in, but I liked it and will follow this series with interest. And finally... what did I think of the new look Meg? Yeah, I quite liked it on balance. Time will tell if the text articles are worthy of inclusion, they may become quite tedious, and there is definitely more advertising than there has been (necessary to keep the cover price down I perceive), but on balance the stories remained strong and the tinkering kept to a minimum. 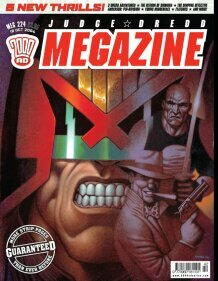 I will miss the reprints, but take the editor's point that in 2004 I could have bought the Extreme Edition comic which re-ran an old 2000 AD story in full. All in all, the magazine remains true to its core values, which is definitely a good thing!